4 years ago, I was given the challenge to write my first article for the LiveChat Blog. The subject of the post was supposed to be about customer service. I dug a little to come up with something worth reading. What came to my mind was that customers behave like kids sometimes. You know, they don’t like hearing the word “no,” they scream and shout, sometimes they make scenes. We’ve all seen it. And I wanted to explain to our readers the basics of this behaviour. I shared this idea with my colleagues from the content team, and they were outraged: “What? You can’t compare customers to kids! They’ll feel insulted!” “Why would they?” I thought. First of all, we’re all customers. Second of all, not everyone behaves like a kid. But if they do, it’s time to start being aware of it. That’s what I believed and I followed through with it. And so I wrote the first article for LiveChat. Being on a monthly trial made me extremely nervous before I hit “publish”. But I finally did. For the record, LiveChat Blog had a small audience back then and our job was to get traffic to our blog and make it popular. Here’s our journey to reaching 100,000 unique views a month and lessons that come from it. 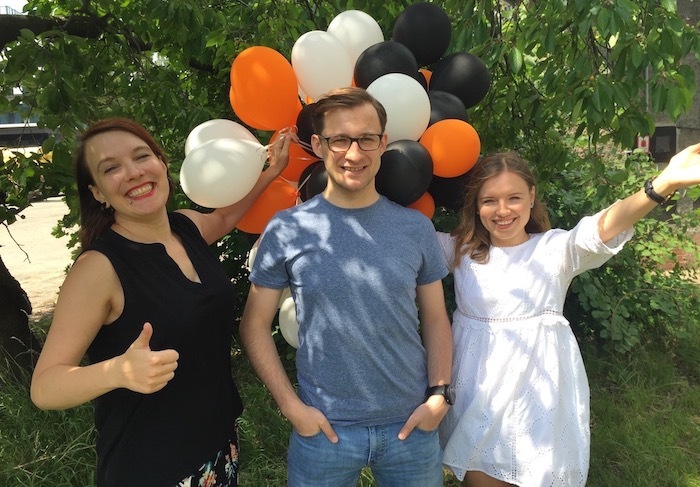 When my friend, Justyna, and I joined the content team, LiveChat Blog had a small group of readers, mostly our customers. Our job was to introduce the blog to the world, position ourselves as customer service experts, so along the way people eventually started a LiveChat trial. At the beginning, we placed two categories in the main menu: customer service and online sales. They both included more detailed subcategories like customer support, customer psychology, ecommerce, inbound sales etc. After a while we noticed that almost nobody was clicking on them. That was the sign we needed to change it. We came up with detailed categories and placed them in the sidebar. That’s how it looks now. We have 24 categories. It’s quite a lot, so we plan to cut off some of them, to make it more clear what the blog is about. We believe in trial and error methods. We try different solutions and see which of them work best. No matter the look we come up with for our blog, there’s one thing that stays the same. And that is the main focus of our blog. We write about customer service, ecommerce, and online communication. In the beginning, I was publishing one or two articles a month. Picking up a subject, doing research, writing and editing took me about two weeks. Then I was looking for a graphic for almost the whole day. Can you imagine that? Hard beginnings. The problem here was that almost half of the company was engaged in our creating process. They could decide that the title is somehow wrong or that the graphics don’t fit. But when you have almost 20 people who can say their minds, it’s hard to make everyone happy. So we needed to cut it off. Once we finished the trial process (woohoo!) and the company trusted us with our writing, we got more responsibility at our work. Writing, graphics and the whole outcome – it was all on us. Making this process more efficient and gaining experience in writing helped us do our work much faster. Finally, we were able to create a content calendar, which every content team should have. Writing posts wasn’t left up to chance anymore. We committed to creating one post a week. Along with Jacob Firuta, there were three of us. We published every Monday, Wednesday, and Friday. The header of the post (something you see after the subject of the email in your inbox) was also personal and catchy. We did our best, and these efforts made a huge difference. 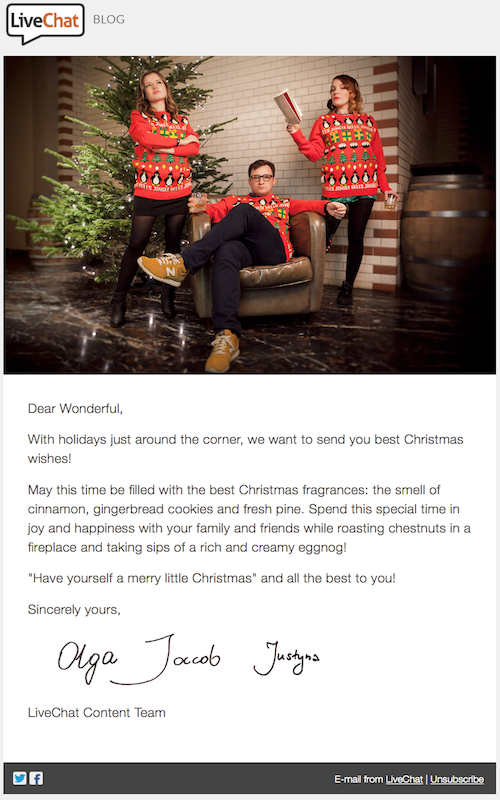 Remember our Christmas email with the personalized image? It was just a cherry on the top. The number of open emails increased twice. People were interested and they responded. They were leaving us comments on the posts and generated discussions. Now, that’s how you know the content lives! The excellent response from our customers encouraged us to promote our posts on social media. Promoting your work on social media is not the most comfortable thing you can imagine, but it has a lot of benefits. We even believe creating content is 70% of work and the other 30% is the distribution. After all, there’s no point in the whole creating effort, if people won’t hear about it. Based on our experience, I want to show you how to do social media right. The first mistake most people make is that they leave links to their work on different social media channels, expecting the world to appreciate it. You need to give something from yourself first. You need to engage in communities you want to post in. For example, LinkedIn has a lot of communities with different topics. Join them and comment on other people’s work. Then, post your work. For us, the response was bigger than if we would just post there out of the blue and disappear. If people feel their work is recognized and appreciated, they feel obligated to at least check out your work. One time, I commented on the post of Forbes’ regular contributor, Victor Lipman. It was about employee appreciation. I also left the link to my article about the importance of appreciation. Not only did Victor read my article, but he also wrote a new post in which he refers to my comment and my whole post on LiveChat Blog. If I didn’t dedicate time to read Victor’s article and comment on it, many new people wouldn’t notice my work. Additionally, we were creating business relationships on Twitter with customer service and ecommerce influencers. After a while, they were likely to share our work, which also gave us the recognition from a completely new audience. For example, Shep Hyken has the series: 5 Top Customer Service Articles of The Week, and many times he featured our articles, followed by a short comment and a link to our blog. Posting our work on social media was a great way to start gaining backlinks to our blog. But it was just the beginning of this strategy. As we saw the value of SEO in gaining backlinks, we wanted to invest more time in it. We decided to put time and efforts into publishing our guest posts on other platforms. We did some research, write down the platforms we were interested in and started to send submissions. 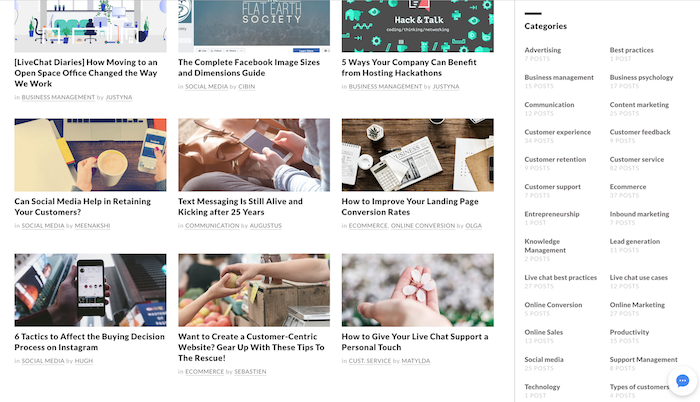 We were able to publish our posts on Shopify, Hubspot, Volusion, BigCommerce, Toggl, and many more. The magic trick of SEO is not just about leaving a link to your content in the article but to do it in the right way. It means an article with the URL livechatinc.com/blog/how-to-say-no-to-customers should be linked under the phrase “how to say no to customers”. Otherwise the keyword won’t work for your good. When we started to write for other platforms, we needed to fill in the gap on our blog. We began to accept guest posts. We’ve created guidelines for potential writers that we strictly guard. The writers cover the keywords we selected for them and help our blog position higher in search ranks. We can say, SEO is another breaking rule that helped our blog to succeed. When at the beginning we focused on promoting content on social media, trying to reach a new audience, we didn’t know much about SEO. We didn’t realize how important it is that our blog posts rank high in Google. We thought writing with the rules of SEO was not creative writing at all – it’s cheating the audience. But we were wrong. The moment that was unbreakable for us was when we went to SEO training with the best SEO company in our city. We realized the content that is in 4th or 5th page in Google, basically doesn’t exist. No one can find it so no one will read it. It’s simple as that! Find a keyword in Semrush that has more than 1,000 search volume. Use this keyword in your headers, and in your content. Find relevant keywords (also in Semrush) and use it in your articles. Describe the images you include in the post with the right keywords (alt text). Link from posts with “weaker keywords” (those who has less than 1,000 search volume) to the ones with strong ones – it will help it go up in the Google rank. SEO needs some time to start working, but you can see the first results after a few days of publishing a post. What’s more, we optimized all of our old posts according to SEO rules. That’s how we started to get views from Google. All the rules we applied to life, began to work to our advantage. We reached a new audience, began to be recognizable on social media, created a bond with our readers through email marketing, and finally, we rank high in Google and gain audience from there. After a year from starting to work toward this goal, we had 100,000 unique views a month. 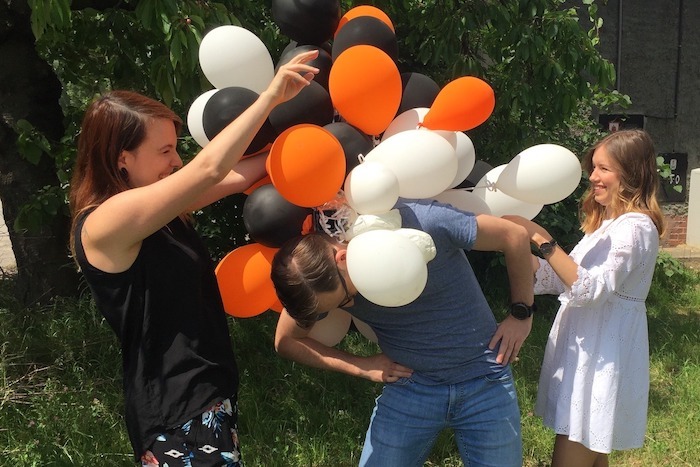 That’s how we celebrated in our office. Remember my first article about angry customers? It turned out great! For two years, it had the most views, it created a lot of buzz on social media, it’s still on the first site of Google (including the Google answer box). What’s more, a Director from University of Florida taught his employees based on this article. OK, enough with the bragging. What’s the lesson here? You need to write about what you know and what you believe in. And you need to back it up with SEO knowledge, social media presence and backlinks from other platforms. That’s the secret to finding an audience and making your blog successful. And let’s not forget about the power of teamwork. A good team can accomplish much more than an individual themselves. Besides, it’s much more fun to work together. If sometimes your ideas are extraordinary, it’s even better. You need to take a risk and watch the results. Yes, we could write “customer is always right,” but who would learn anything from that? Following this idea, Justyna even wrote a post: “Why the customer is not always right,” which, as you can assume, became very popular. So don’t be afraid to put yourself out there, promote your work and always improve your skills by learning from the better ones. I know I am!